Virtually everyone in the US faults North Korea for threatening to cancel the Trump-Kim summit scheduled for June 12 in Singapore. No one, including the liberal media, bothers to address North Korea’s conditions for a successful summit or the reasons for its warning about a cancellation. Let’s review the matter with some objectivity. First, we should keep in mind that from the outset many specialists, myself included, identified interpretations of “denuclearization” as a likely source of contention. The Americans should have known from long experience that North Korea is not going to give up its principal bargaining chip and strategic deterrent in advance of receiving incentives. After all, Kim Jong-un probably believes that North Korea’s advances in strategic weapons are precisely what got Trump to accept an invitation to a summit meeting. Second, the incentives the North Koreans have always demanded are security assurances and an end to “hostile” US policies. They want to know the US will not attack their country, will not seek regime change, and will, with China and South Korea, sign a peace treaty guaranteeing the DPRK’s security. What has happened since the inter-Korean summit and the lead-up to the US-DPRK summit? 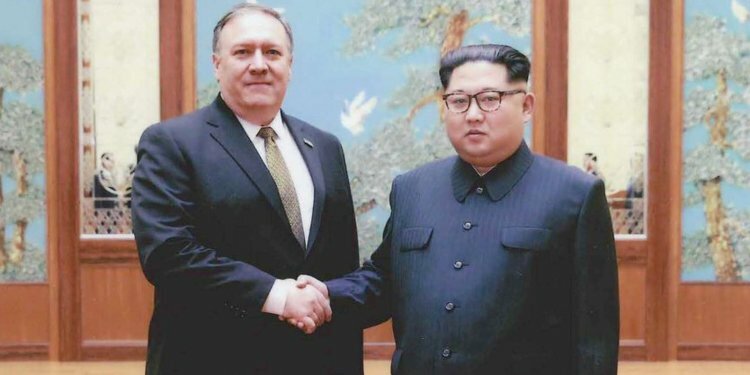 On the positive side, Washington has acknowledged North Korea as a negotiating partner, Trump has treated Kim with respect and even exaggerated politeness, and Secretary of State Mike Pompeo has had two apparently upbeat meetings with Kim at which private US investment was held out as a reward for North Korea’s denuclearization. In turn, North Korea has stopped propaganda attacks on the US, has invited observers to witness destruction of its nuclear weapon test site, has released three Americans held prisoner, and has seemed (to judge from visitor and press accounts) eager to forge a new relationship with the US. But there have also been ominous signs of trouble, starting with ambiguous messages from the US side. National security adviser John Bolton, predictably, has laid down a hard line, suggesting that complete, irreversible, and verifiable denuclearization—CVID, the same condition of the Bush and Obama administrations—would be demanded of the DPRK before any concession would be made. Denuclearization, he said, would have to cover all facilities, equipment, and materials—in short, everything having to do with a nuclear-weapon program. And Bolton spoke of a “Libya-style” resolution of the nuclear issue, absolutely the worst possible analogy because of its implicit threat of regime change. Trump himself has insisted that “maximum pressure” would remain in place until an agreement was reached. We now know that “pressure” means not only sanctions but also military exercises directed at the North Korea threat. The first warning of possible cancellation of the Trump-Kim summit came in response to the US-South Korea exercise called Max Thunder, a two-week drill involving B-52 bombers and F-22 Raptor fighter jets. North Korean media mainly criticized South Korea’s participation, which it said violated the Panmunjom Declaration between Kim Jong-un and South Korea’s President Moon Jae-in on building a peace regime. In cancelling upcoming high-level talks with Seoul scheduled for May 16, the official Korea Central News Agency also warned that the US “will have to think twice” about the summit with Kim and said Pyongyang will “closely watch” US behavior. Very quickly, however, North Korea’s warning became more serious, apparently in response to US reports indicating that complete denuclearization was the key to progress at the summit. Perhaps the North Korean elite thought denuclearization was negotiable, especially since Trump is desperate for a “win” that would supposedly put him in line for a Nobel Peace Prize. Or perhaps the military hard-liners around Kim persuaded him that Trump could not be trusted to budge from the American determination to eliminate North Korea’s entire nuclear arsenal. So there is plenty of blame to go around if the Trump-Kim summit never happens. But one thing is clear: the barrage of criticism leveled exclusively at the North Koreans is unwarranted, and reminiscent of Cold War propaganda. Their views are being dismissed by one and all as typical of their trickery and deceit, when in fact they are well known. Wishful thinking is no substitute for a careful engagement strategy. Next time, the US side should better inform itself of the North Korean perspective and priorities, and listen when an adversary says that trust building requires a long-term process. Re: trust building requires a long-term process. The more I contemplate this ostensibly straightforward formulation and consider historical exemplars, the more skeptical I become about the realistic chances of success. (By the way Mel, I can already hear you saying: “but we haven’t given it a real shot”). Actors, state and non-state, may– in all good faith– begin a process of trust building and incremental problem resolution but almost inevitably stuff happens, midstream, to disrupt the initial plan. I leave it to you to fill in applicable scenarios. At the end of the day a new baseline for continued discussions is created and new expectations are formed. As disruptions accumulate, more optimistic visions curdle and opponents within respective party groupings become more credible. The result is that investments in collaborative long-term solutions depreciate in favor of more radical demands for the imposition of one party’s favored outcome. Need I offer Jerusalem as a current example? For me, at least, it would be helpful to have some good historical case studies of robust long-term trust building processes that survived disruption and went on to produce desirable results. Even better, some analysis of what allowed this to happen might help.